'S e prìomh-bhaile Libèiria a tha ann am Monrovia. Anns a’ bhliadhna 2003 bha 572,000 duine a' fuireach anns a' bhaile fhèin. Mar sin dheth 's e am baile as motha den dùthaich cuideachd. Tha Monrovia suidhichte eadar a’ Chuan Siar agus an Abhainn Mesurado. Tha am baile na laighe timcheall air a' phort-mara aige. 'S e seo an co-chomharran aige: 6° 19’ Tuath agus 10° 48’ Iar. 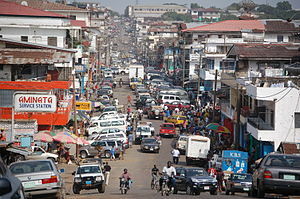 Tha Monrovia 361km air falbh bho Freetown (Siarra Leòmhann), 478km bho Chonakry (Gini), 753km bho Abidjan agus 612km bho Yamoussoukro (Costa Ìbhri). Tha e suidhichte air an àirde an iar-thuath na dùthcha, aig 30m os cionn ìre na mara. Chaidh am baile a stèidheachadh anns a’ bhliadhna 1824, ach bha daoine a’ fuireach an seo roimhe sin. Chuireadh Monrovia mar ainm air a’ bhaile airson urram a chuir air James Monroe, ceann-suidhe nan Stàitean Aonaichte aig an àm sin. 'S e teas meadhan malairteach ‘s gnìomhachail a th’ann. Tha am Central Bank of Liberia, am banca as cudthromaiche den dùthaich, ann am Monrovia cuideachd. Tha bàtaichean a’ dol gu Greenville agus gu Harper. 'S e an Roberts International Airport am port-adhair as fhaisge, tha e mu 60 cilemeatair air falbh bhon bhaile. Air a tharraing à "https://gd.wikipedia.org/w/index.php?title=Monrovia&oldid=444171"
Chaidh an duilleag seo a dheasachadh 23 dhen Ghearran 2014 aig 14:49 turas mu dheireadh.